This is a fantastic region though, a string of towns and trails that in lesser countries would be the main draw. You’ve got stunning scenery, impressive Inca ruins, women decked out in their embroidered cacophony of colors, sprawling markets, and a calendar of festivals that could keep you partying for weeks. There are a few greatest hits attractions that are on all the tour bus stops, such as Pisac and Chinchero on market days. 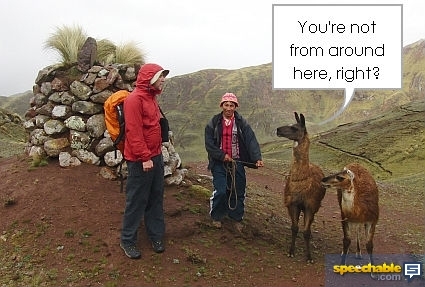 There are other spots, however, where you will only find intrepid backpackers who aren’t in a hurry. Head into the mountains and you’ll see more animals than people. After I met the alpaca above at 4,050 meters, I descended with a guide through a canyon and past this Pukamarka village, which was so picture-perfect it was hard to believe it was not part of a movie set. But not an electric wire in sight. Past the village, on the other side of the pass, we went through a canyon where we saw an eagle and falcons were fighting in the air overhead. 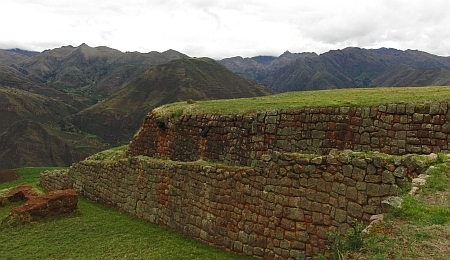 Then the trail came to a gate and an incredible Inca structure that almost nobody visits, Huchuy Qosqo. It is perched 3,350 meters above the town of Lamay and the thing is, we took the easy way to get there. If you take the most direct route, it’s a very steep and long hike up the side of the mountain, which will take you several hours and a probably a gallon of water. Amazingly, there’s still a hut up there manned by someone who collects admission ($7). My guide was from Andean Experience, but if you put “Huchuy Qosqo” into a search you’ll find dozens of operators doing one-day hikes to the ruins by the route I took or incorporating this into longer group treks. You can do it on your own too in theory, but the trails aren’t marked and the locals speak Quechua, so you’d better find a good map. 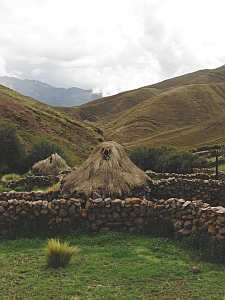 Peru seems like an interesting place and the countryside looks so amazing. Great for backpacking. I’ll pass this along to my readers. One of these days I hope to read your book, it is hard to find specific books.